I came across the issue of the wordpress plugin not finding the vanilla install folder. I spent some time with the issue, and wanted to share my experience, as when researching, I didnt see the cause of the issue on other discussions. 1) Do you have cURL installed. Check phpInfo to see if installed. The wordpress plugin uses the command wp_remote_get() to check if the vanilla url is correct. 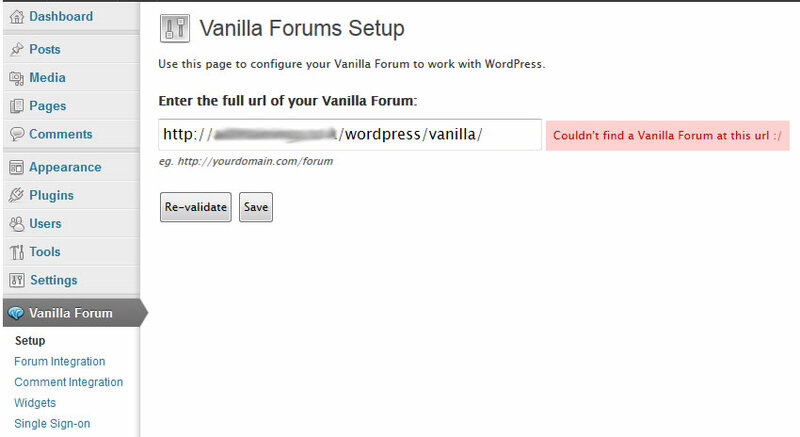 This wp_remote_get() uses cURL, so if you do not have it installed, you would get the "Couldn't find a Vanilla Forum at this url " message. This message doesnt take into account if you got cURL installed or not! The method used to check the vanilla URL is wp_remote_get(). This uses a url remote connection. IF you have vanilla installed on the same server as wordpress, the wp_remote_get() will attempt to connect to your vanilla URL address by requesting a URL connection remotely. So this connection leaves the server.... as the request is local, the connection attempts to go back to the server. At this point, the server blocks this.. This is known as a loopback request. Some hosting companies block this for security reasons.. If you have loopback disabled, then you would get the message "Couldn't find a Vanilla Forum at this url "
There seem to be many discussions on this, and you will have to do some searching, but the above are two issues which are not explained in the message you get back - "Couldn't find a Vanilla Forum at this url ". so do i have to enble loop back?